Make it the rule of thumb to never open an email attachment from an unknown sender! The Heimdal team has collected data about a spam run that is currently rolling out, targeting random email addresses. The spam email pretends to include a scanned document. However, the included .doc contains macros, which, once accessed, will attempt to download the online bank and information thief Dridex. These are compromised webpages which return Dridex. The Dridex malware is run in the memory, never dropping a single file onto the hard-drive. This reduces the payload’s footprint on the user’s system and it provides a very low detection rate for traditional security products, such as antivirus. In the next step, Dridex will contact a series of C&C servers to deliver the data banking harvested from the victim’s system. 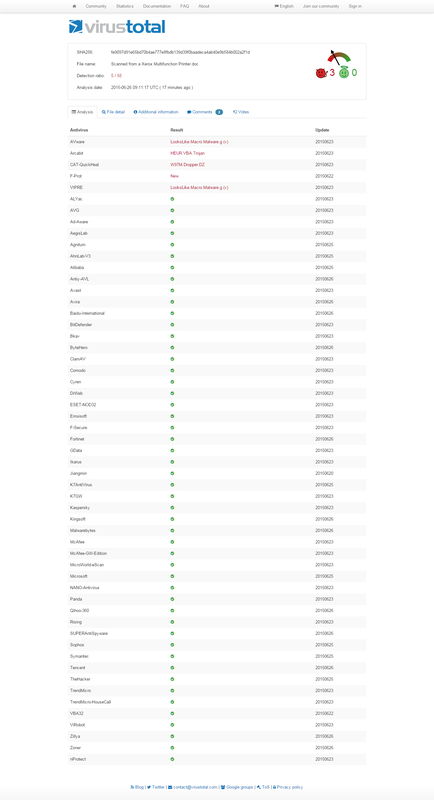 Our team has blocked a large number of these domains in the Heimdal Secure DNS, so our users can be protected from data leakage and data loss. The above data is split into two data sets, where both are XOR’d and contain configuration and web injects. In the configuration step, we have observed various features that Dridex uses: http shots form-grabber, httpinjblock, http block, click shots httpinjects, etc. From analyzing the configuration and communication with C&C super nodes, we can see that this campaign is marked with BOTid: 120. There are numerous other targets and many sub-functions that make Dridex a dangerous infection for most businesses and individual users with access to online banking. Dridex is a strain of banking malware that leverages macros in Microsoft Office to infect systems. Once a computer has been infected, Dridex attackers can steal banking credentials and other personal information on the system to gain access to the financial records of a user. Dridex is an evolution of the Cridex malware, which itself is based on the ZeuS Trojan Horse malware. According to security firm Trustwave, the Dridex banking malware initially spread in late 2014 via a spam campaign that generated upwards of 15,000 emails each day. The attacks primarily focused on systems located in the United Kingdom. It’s important not to forget that Dridex is a sophisticated infostealer that systematically harvests data from infected machines. The compromised machines are then bound into a P2P based botnet, where they continue to transmit the collected data. Anti-virus detection for this campaign is low. After about one month of downtime, the gang behind Dridex (the notoriously refined banking malware) resumed its operations with a new spam campaign which was launched yesterday, late at night. The unwanted e-mail arrives with an attached document that, once opened and its contents clicked by a careless recipient, will drop Dridex onto the machine. [pretends to come from an English company named “Ucblinds”]. The main component binds the machine into a botnet, but it also captures and delivers various sensitive information to the malicious server. From the configuration file, it is clear that, in the case of BOTid # 220, the attack’s primary target is the UK. 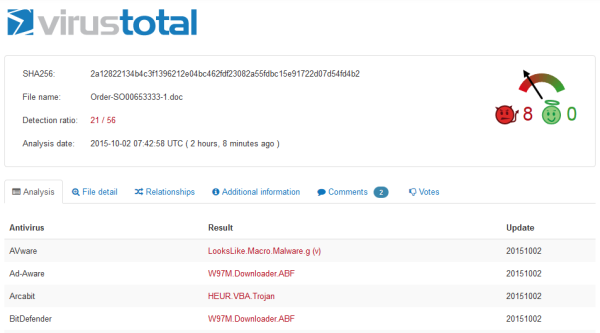 Antivirus detection is still unsatisfactory: 21/56 on VirusTotal. Heimdal Security has collected data regarding a recent “spray & pray” spam campaign. Victims are lured to click because of the subject line which indicated that a scanned document is attached. The attachment is a XLS file with macros, which, if activated, will download Dridex from multiple servers and infect the victim’s PC. The attached malicious XLS document achieves only very limited antivirus detection, which makes the infection very effective on PCs who are not adequately protected. We advise online banking users to take all necessary security measures to ensure the protection of the confidential data and financial resources. Set strong passwords for online banking accounts and use 2-step authentication when possible. Read and apply the 15 Steps to Maximize your Financial Data Protection. 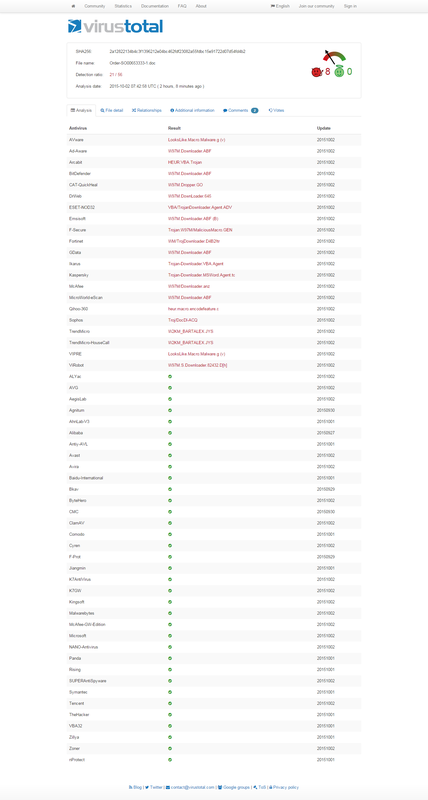 Dridex was first spotted in November 2014, followed by spam campaigns in March, April and May this year. An article on the evolution of Dridex was recently published on the FireEye blog.